Here’s a fun post: a delicious recipe for loquat sorbet made with a splash of tequila and sprinkled with Hawaiian black lava salt. The loquats came from a tree in our backyard. We started it from the seed of a tree down the street and it’s taken off. According to the Specialty Produce App, loquats grow well in most Southern states, but usually only fruit in California, Florida and Hawaii. This post is a family collaboration! Papa Bird (our sorbet master) came up with the recipe and shot the “making of” photos. The child labor came from the (not so) Baby Birds. The girls have been honing their kitchen skills with their new knife set. They love the safety knives from Playful Chef (Amazon link) which are designed to cut through apples and carrots, but safely fit in young hands. They use them almost daily. The kids also harvested the loquats from the tree, selecting the ripest, softest and sweetest fruit. 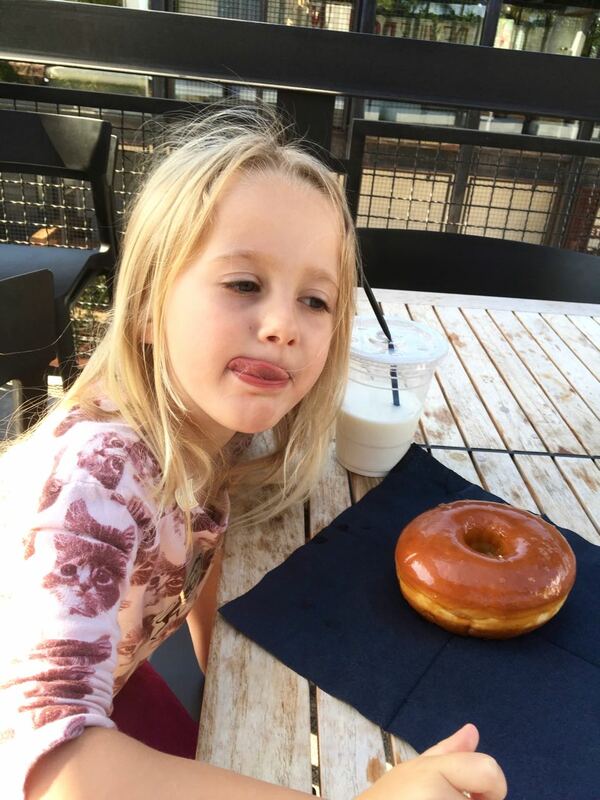 My kids enjoy cooking, especially sweet treats. And they LOVE making and eating anything from our garden. Loquats are from the same family as apples, pears and roses. The fruit have a mild, sweet, slightly sour and refreshing flavor. They grow rampant in Southern California. So check your neighborhood and forage! If you or a friend have a tree, you likely have more fruit than you can deal with. And sadly, there are not very many loquat recipes out there. 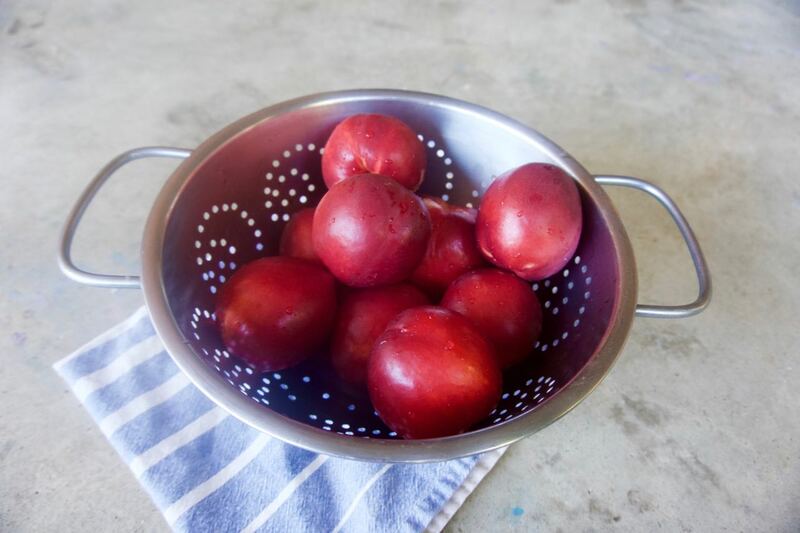 Select fruit that are a little soft and pull off easily from the branch. Next, Papa Bird set up an assembly line for the girls outside. The fruit can be juicy and sticky. The kids cut the fruit in half. Loquats contain 3-7 large, hard, inedible seeds in the middle. Remove the seeds. The fruit are now ready to run through a juicer. This sorbet came out delicious! To make 2 cups of juice, Papa Bird used approximately 60 halved, seeded loquats. We have a Breville compact juicer, which quickly separated the juice from the skin and less edible parts. Sorry I haven’t written much in a while. Life gets busy! Lately I have been sharing quick Instagram posts. It takes a fraction of time to post a quick picture there, and can be done “in the moment.” Yet instant is fleeting and soon forgotten. And days like this last Sunday are meant to be savored and remembered. 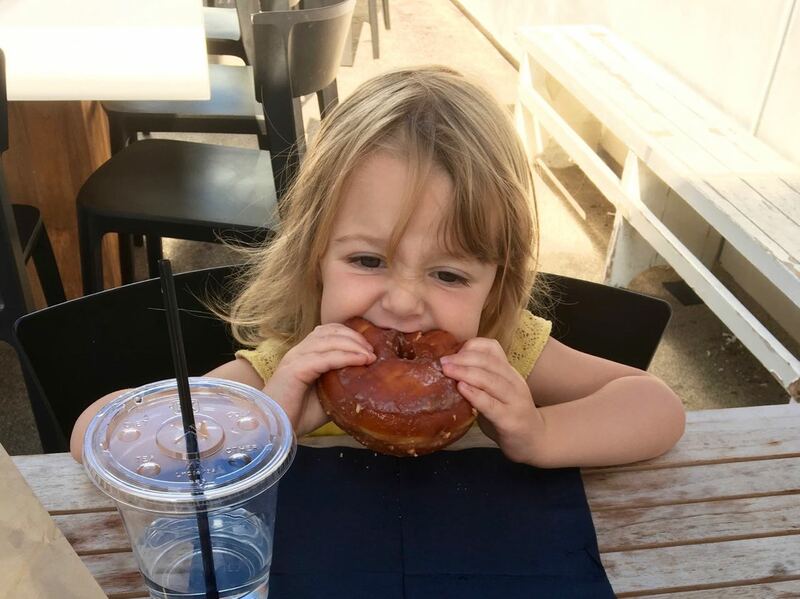 Ever since Papa Bird and I flew the coop to celebrate the first anniversary of the fun restaurant/night spot Kettner Exchange, we have had a gift card to their side business, Devil’s Dozen Donuts. The donut shop shutters up once they sell out and every time I’ve been by we were too late to get any. I try to feed the kids a balanced breakfast, aka not pure, refined sugar. But I got the tip that on the weekend they make a secret menu item: a breakfast sandwich with eggs and bacon on an unglazed donut. It sounded healthier, right? 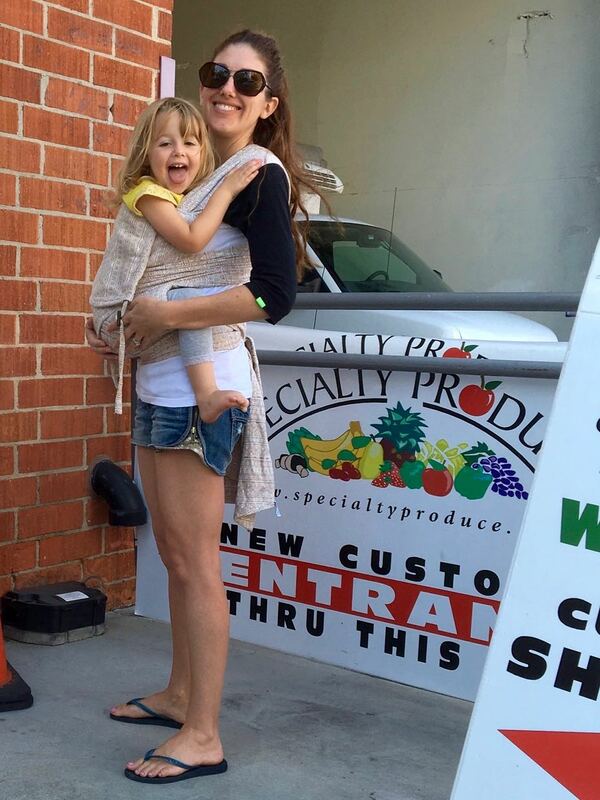 Next the girls and I rolled over to our favorite place to shop, Specialty Produce. The last time we were there, Littlest Bird thought it was hilarious to run away from me. Keeping kids close is a big rule there as it is a busy industrial warehouse, with forklifts, carts, and lots of people. She even ran past an “employee only” sign into the truck loading area. So this time I asked her if she would like to “go uppies.” We haven’t worn Miss Independent in any wraps or the Ergo in ages, but she thought it was a blast to go for a ride. Problem solved! 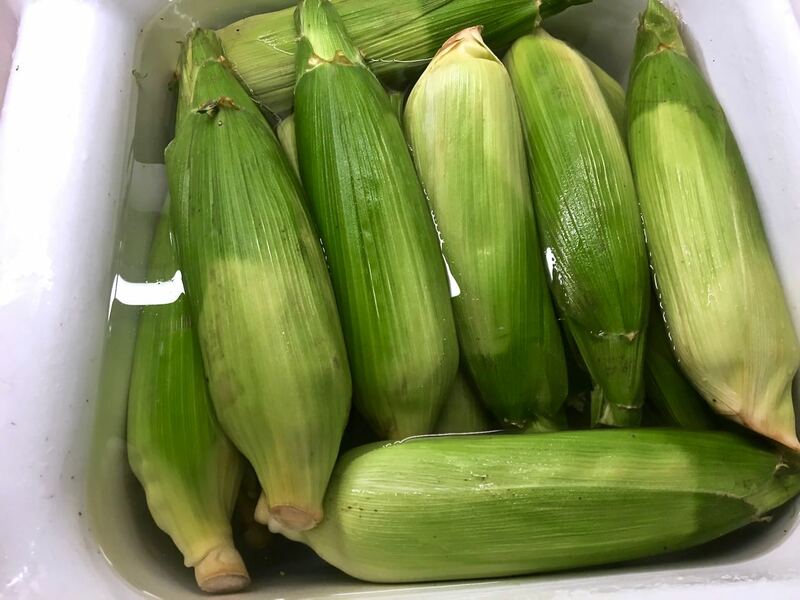 Soak corn in the husk in water for 10-30 minutes. Grill for 20 minutes or so at 375*-400*. Simple food, peak of season… the best way to eat. We also brought summer berries and stone fruit (all from local farms and found in the Farmers’ Market cooler) to share with our friends. 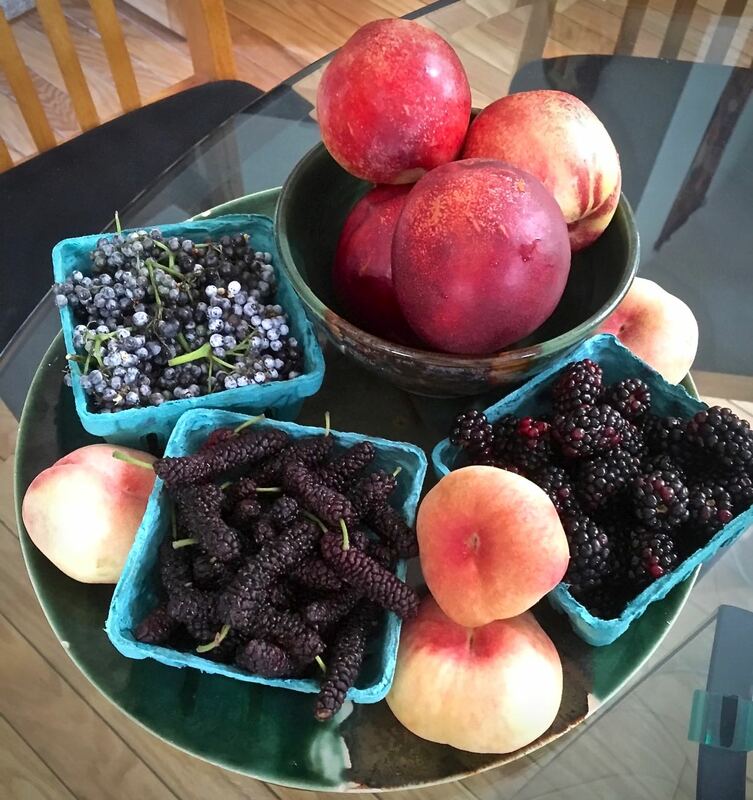 Clockwise from the top in the picture below, Carmen Miranda nectarines, blackberries, Saturn peaches, Persian mulberries, and elderberries. The elderberries were quite tart. I later looked them up in the Specialty Produce App and learned elderberries are meant to be cooked. Technically they are considered poisonous raw (oops) but the toxicity level is pretty low. All of the pictures in this post were taken with an iPhone, with the exception of the following. I received a new camera for my birthday and have been trying it out. This is a preview for an upcoming post for a nectarine pie. Please hold me to it so I finish the new recipe before summer is over! And if that weren’t enough yumminess for one day, we sampled nearly half the menu at the soft opening of a new restaurant. 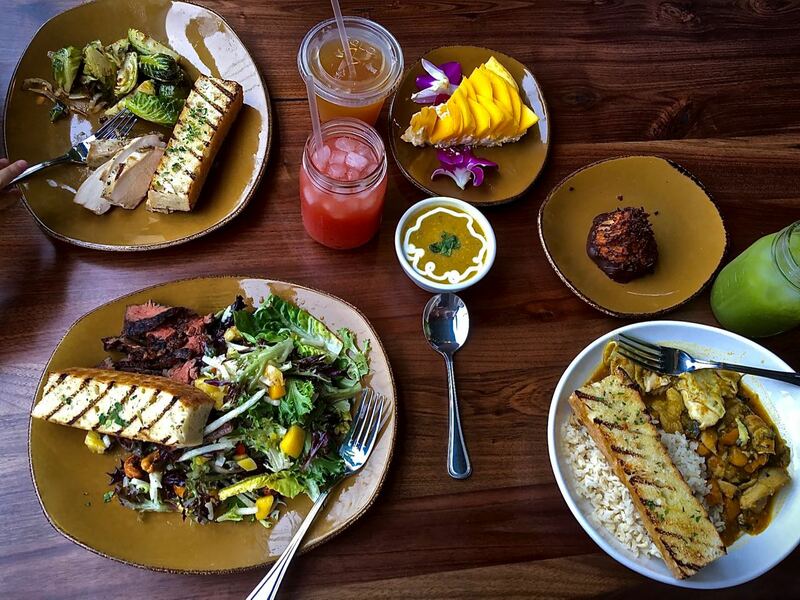 Urban Plates is a smallish chain with nine locations throughout California. They focus on “from scratch” salads, braises, pastries and more, and highlight quality organic and natural ingredients. If you have been reading my posts, you know that’s how we like to cook and eat! See the current menu here. From left to right: the urban kid plate with grilled free range chicken, roasted Brussels sprouts with turkey bacon, and chargrilled focaccia, served with organic apple juice. Seasonal replenisher (a watermelon and mint agua fresca.) 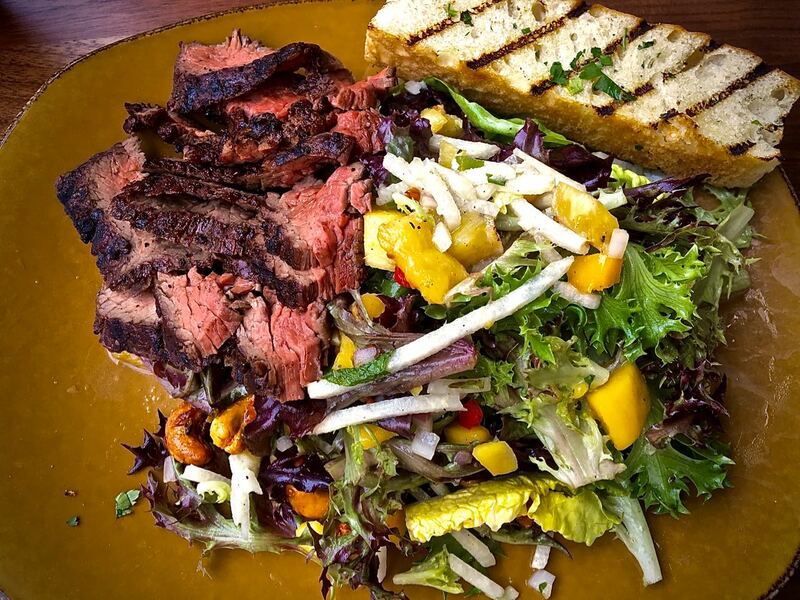 The grilled steak salad with pineapple-mango salsa, jicama, mint, coconut roasted cashews, and a mild jalapeno lime dressing. Corn and poblano soup. Moroccan chicken braise (free range chicken slow cooked with squash, onions, preserved lemon, olives, turmeric, paprika, cumin, ginger, cinnamon, parsley, cilantro) with brown rice. Seasonal green drink. And finished with a chocolate dipped macaroon and a slice of famous mango tart. It was all delicious! 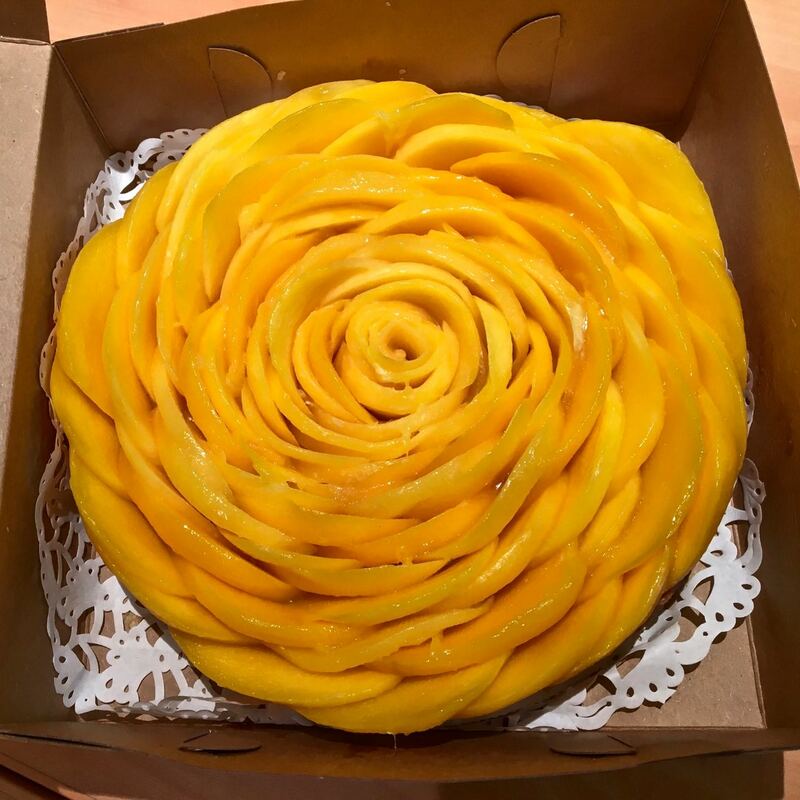 Ah the famous mango tart! This dessert is what started it all… My co-worker was raving about the tart one night and then brought one in for us to share. The fresh mango is perfectly ripe and painstakingly shaped into flower petals. The cookie crust is crisp and not too sweet and the rum cream filling subtle. Perfection! My dad would’ve loved this dessert. I snapped the above pic and posted it on Instagram. I then started following @urbanplates and learned they are in the process of opening a new restaurant location in San Diego. Their community manager invited us to the soft opening. That’s the best of social media, right there! I almost forgot to add, all of the money collected at the opening went to St. Vincent de Paul’s. I used to work at the shelter for four years and was happy to have our money go towards the homeless and hungry after such feasting. As we enjoyed our lunch, I noticed that the woman next to us, eating with her daughters, looked awfully familiar. Turns out it was cooking show host Melissa D’Arabian. 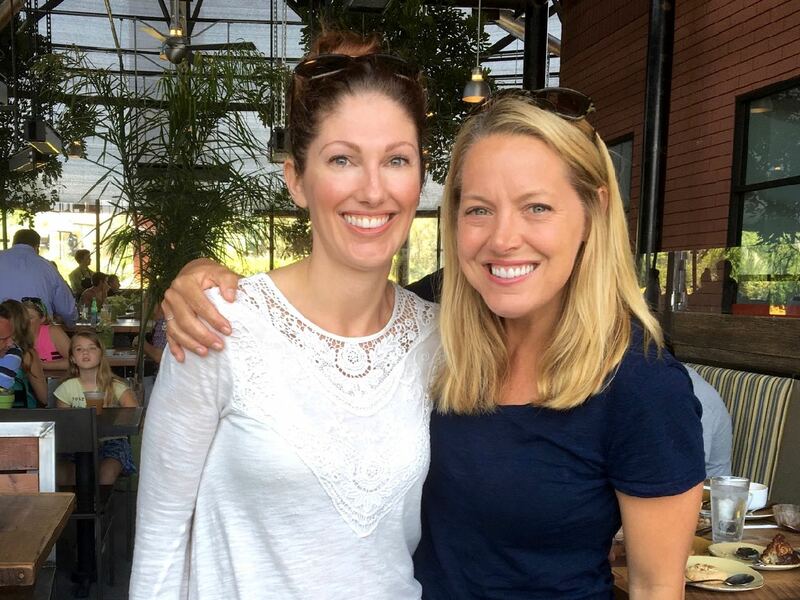 She comes across on TV as genuine and friendly, and she is even nicer in person. We met three of her four daughters, and learned her daughter Charlotte loves cooking with her. Little Bird, who has been cooking since before she could walk. See this post of her first recipe here. For more cuteness, see this short video of Little Bird at age 3. She also LOVES watching other kids cooking. We have already seen some of Charlotte’s videos, like this one. We will be back to Urban Plates, and I will order the refreshing steak salad again. As for last Sunday, our feasting did not stop there. We ate very well at our potluck with good friends. I left my phone/camera in the backpack and enjoyed the company. You’ll have to take my word that the food was all delicious, homemade with love and authentic. Arroz con pollo from a Cuban, homemade tabouli, Caprese, Asian grilled drumsticks, cornbread and potato salad, various tequilas, wine, cheese, cake…. Never stop, my friends! Keep eating and enjoying life. Fresh shishito peppers are in season. We received some in our most recent Farmers’ Market Box from Specialty Produce. 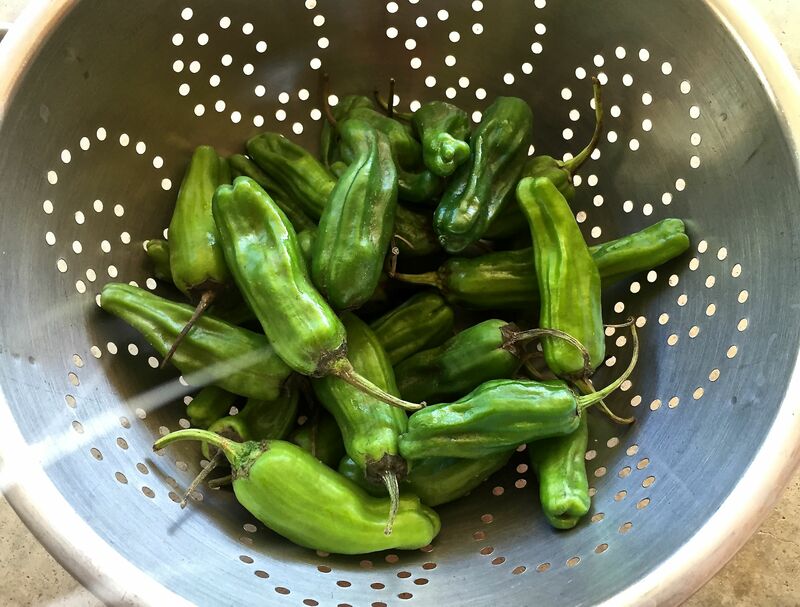 * Shishito peppers are a small, mild pepper, very similar to a Padron pepper. Approximately every 1 in 10 is spicy, which makes eating them like a fun, culinary version of Russian roulette. When I lived in Spain, one of my most favorite tapas was pimientos de Padrón, in which the peppers were simply cooked with salt and pepper. When my sister and her family came down to help celebrate our Little Birds’ birthdays, we cooked up a batch. We were loosely inspired by the Shishito peppers at Mahe in Seal Beach, which are tempura fried and covered in a ponzu sauce with bonito flakes. We just seared ours in a hot pan instead of tempura battering them. Since we also ordered pomegranates from Specialty Produce, I let pomegranate take center stage in my ponzu. And to mimic the fishy hint from the bonito flakes we added fish sauce into our version of ponzu. Well they turned out great, so I picked up another batch of Shishitos from Melissa’s Produce at Sprouts and made it again. Don’t you love the look of our picnic table (above)? Papa Bird got the matte black look by charing (burning) the wood in the Japanese tradition of Shou Sugi Ban. It also preserves it from the elements. Notes: 1. I made this once in a wok and once in a large frying pan, and I liked the frying pan better because I could get all of the peppers to fit in it, which made it easier to blister them evenly. You could also use cast iron or broil them. You want to cook them quickly on high heat so that they blister. If they are in the pan too long they’ll steam and get mushy. 2. I used avocado oil because it is a neutral tasting oil that is suitable for high heat. (It’s also good for you!) You could use grapeseed oil or another vegetable oil. 3. The peppers cook very quickly (just a few minutes) so have the sauce and other elements ready to go before you start them. 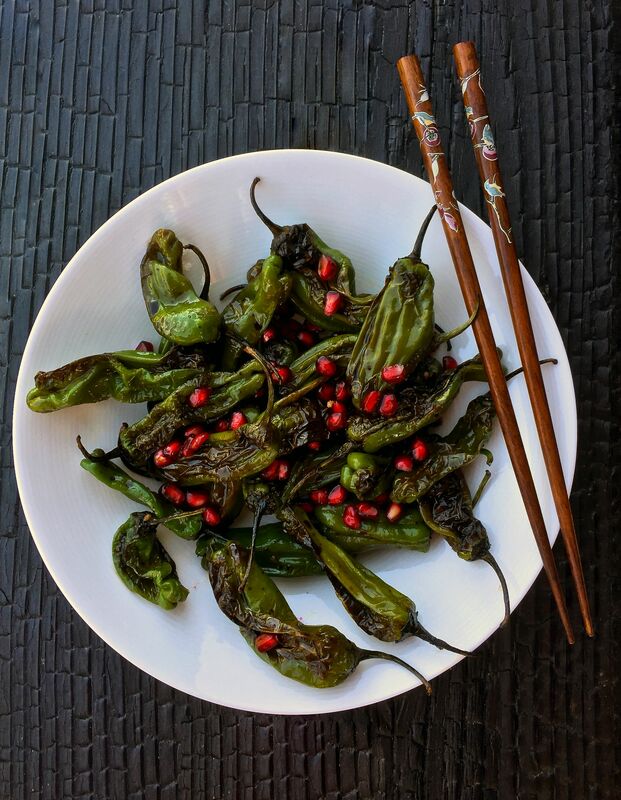 Shishito Peppers are blistered in a wok or pan, and tossed with a pomegranate ponzu made with pomegranate concentrate, soy, fish sauce and Go-Chu-Jang. Rinse and dry peppers, discarding any that no longer appear fresh. Mix the pomegranate concentrate, soy sauce, fish sauce, gochujang, avocado oil and vinegar together in a small mixing bowl. Taste and adjust according to your preference. Set aside. Prepare the pomegranate arils by pulling them out of a fresh pomegranate and set aside. Heat the remaining tablespoon of oil in a medium high to high pan or wok. When it is hot add the peppers. You want them to cook quickly and hotly, so that they blister on the outside. You don't want them to steam, or sit too long. Once the peppers are cooked, pour about half the sauce to all of it (depending on how sting or saucy you like it) over the peppers and very briefly (30 seconds) continuing cooking. Remove from the heat, garnish with the pomegranate arils and serve immediately. *Specialty Produce is the leading supplier of fresh produce to San Diego’s top restaurants. They also let retail shoppers (aka normal home cooks like me) buy from the warehouse and feature local farms in a weekly Farmers’ Market Box. 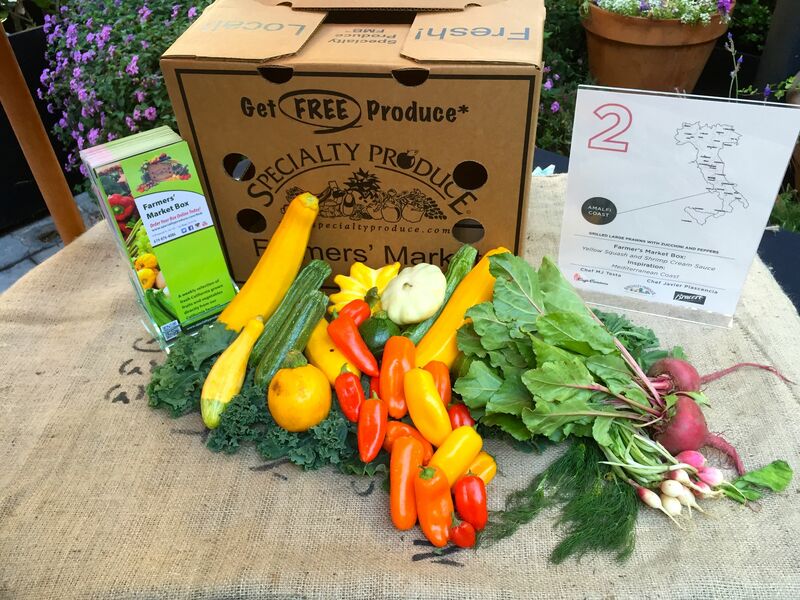 If you use the group code BABYBIRD when signing up for a Specialty Produce Farmers’ Market Box account here, you will automatically have $2 taken off each box. For $20 – or $18 for you – it is a generous amount and variety of produce. I don’t receive any kickbacks, per se, on your purchase, but I not so secretly want to be invited to more of their events, so letting them know I sent you by using the code is very much appreciated! I consider recipes to be inspiration, not gospel. This next recipe, a roasted veggie salad, is intended to be a template, not a prescription. I had beets, radishes, summer squash, green beans, dill and oranges on hand. But PLEASE substitute anything you might have. Since learning about Specialty Produce at this event, we have since ordered their Farmers’ Market Box twice. I’m definitely a fan. You can see a sample below. If you use the group code BABYBIRD when signing up, you will automatically have $2 taken off each box. For $20 – or $18 for you – it is a generous amount and variety of produce. I don’t receive any kickbacks, per se, on your purchase, but it is possible I will get invited to more of their events, so letting them know I sent you is very much appreciated! Enter the giveaway at the bottom of the post to receive a box for FREE. If you have been a long time reader of this blog, you may remember my focus on the produce of our yard… see this early post on a Three Sisters Succotash, for example. But with the current drought, we have really let most of our garden go. Sadly, for the first time in seven years, there is no summer harvest. Having fresh, local finds from Specialty Produce’s CSA-type box is proving to be the next best thing. For this particular box, I ended up hitting the road right after getting it to take the Little Birds up to my sister’s house. I didn’t want the produce to go to waste, so I threw it in the car with us. 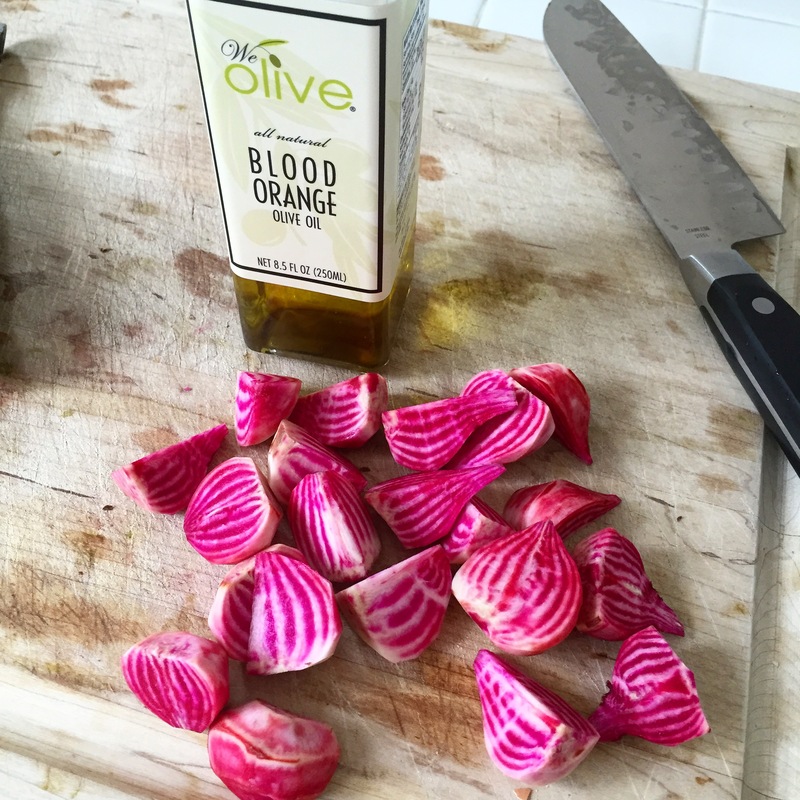 As luck would have it, she had plans for us to go to her friend’s BBQ and asked me to make a “veggie side.” I found some delicious blood orange olive oil in her cupboard, which I used for both roasting the veggies and the vinaigrette. Aren’t those little beets pretty? Seasonal cooking: take what you find in your Farmer's Market Box, from the CSA, or your backyard, cook simply to highlight the freshness and toss with a light vinaigrette. I list the ingredients I used, but please improvise. Mix the oil, vinegar, orange juice, salt and pepper. Toss on the veggies when slightly cooled. Top with the chopped dill. What are your favorite ways to enjoy summer bounty? Mild Anaheim or Poblano peppers are roasted, peeled and stuffed with a quick filling of shrimp and gooey cheese. Served with a fresh red pepper and tomato sauce, or a green tomatillo salsa verde, they make the perfect dinner alongside rice and beans. I am experimenting with a new post format: just a quick look at what we have been eating. I have such a backlog of photos and recipes, and never enough time to write up the posts. I wanted to play around with a quick post, without writing up a full recipe. Maybe the photos and descriptions will inspire your next dinner? Please let me know what you think. I’ll be happy to share the recipes if requested. For tips on roasting the peppers, see this post on Spanish Tuna Stuffed Peppers.